Together with Jamie we’ve created a fantastic new selection of products. We’ve gone the extra mile to give you a bigger, better choice* – with more than 80 new products on sale in over 500 of Shell’s service stations across the UK. Go on, call in to your local Shell service station today for a delicious bite to eat. Introducing the new Jamie Oliver deli by Shell – helping busy people eat well on the go. Our tasty sarnies, deli selection and salads are made with great ingredients, honestly sourced and put together with love and care. Now you can find great food on the road, wherever you’re heading. 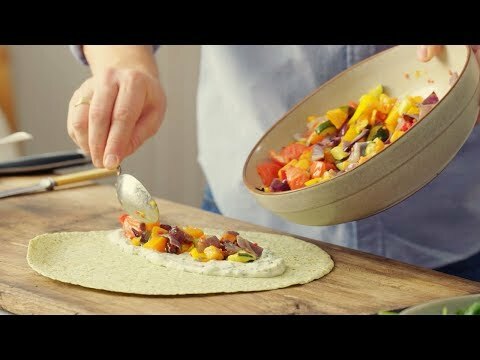 A short video of Jamie Oliver talking us through how to make a Ricotta and Roast Veg Wrap. Jamie in his kitchen, standing at the workstation with chopped chives on a chopping board. Fresh ingredients are dotted around the kitchen. Close-up of Jamie chopping tomatoes, placing slices of boiled egg on top of bread and capers, adding thick ham on bread with mustard, and pressing everything together as a sandwich with the addition of cheese and fresh greens, cutting the sandwich in half and moving the two halves apart to show the filling. and it can be a real challenge to get something delicious and that's trusted, and that is why I've collaborated with Shell. Cut back to Jamie addressing audience. Close-up of wrap cut in two halves, filling is on display. a beautiful roasted veg Mediterranean wrap. Close-up of Jamie picking up a tortilla from a pile of tortillas on the table and then turning it over in his hands. Close-up of Jamie spooning the chive, ricotta and yoghurt mixture onto the tortilla, which sits on the chopping board. and some lovely delicate chives. Cut back to Jamie addressing audience whilst holding large bowl of chopped vegetables that he’s spooning onto the tortilla. Close-up of Jamie spooning the chopped vegetables on to the wrap. Cut back to Jamie spooning the chopped vegetables on to the tortilla. Close-up of Jamie spooning the vegetables on to the wrap. Close-up of Jamie adding spinach on to the wrap. Close-up of Jamie wrapping the wrap. Close-up of Jamie cutting the wrap in half and moving the halves to show the filling. Cut back to Jamie addressing the audience. and have a little try. Upbeat piano music. Close-up of Jamie moving the halves to show the filling. Subject to availability. See www.Shell.co.uk/JamieOliver for more information. Mediterranean roast veg & ricotta wrap - Including a whole portion of your daily fruit and veg, this rainbow wrap is the perfect balance of sweet roast veg and creamy ricotta – it really hits the spot. Jamie in his kitchen, standing at the workstation, chopping chives on a chopping board with a knife. Fresh ingredients are dotted around the kitchen. Jamie stops chopping and continues to address the audience with the knife in his hand. 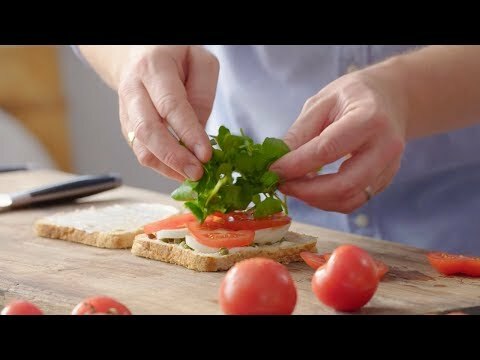 Close-up of Jamie placing slices of boiled egg on top of bread and capers, chopping tomatoes, adding thick ham on bread with mustard, pressing everything together as a sandwich with the addition of cheese and fresh greens, and cutting the sandwich in half. bring you loads more choice, better ingredients, great combinations and this one, this is a great one. This is basically a roasted veg wrap with ricotta cheese, delicious! So let me show you what's in it. Cut to close-up of Jamie chopping chives. Cut to Jamie at the workstation, still chopping. Cut to close-up of Jamie gathering chopped chives in his hands and walking out of shot. So, this dish starts with the ricotta. Cut to Jamie addressing the audience with the chives in his left hand and stirring a bowl of ricotta and yoghurt with his right hand. Now, ricotta is a fantastic Italian cheese. Close-up of Jamie sprinkling the chives into the bowl of ricotta and yoghurt and placing a tablespoon into the bowl. Jamie mixing the chives and the ricotta with yoghurt. Close-up of Jamie mixing the chives and the ricotta with yoghurt, turning the bowl. Jamie stirring the chives and the ricotta with yoghurt. Close-up of Jamie mixing the chives and the ricotta with yoghurt. Jamie stops mixing and reaches to his left on the table. we're using kind of like a flatbread, a tortilla, and this has got spinach and parsley in it. Close-up of Jamie spreading the mixture on the tortilla. We're gonna dollop that ricotta and it's a really brilliant carrier of flavours. Put it out in like a little semicircle. Cut back to Jamie addressing the audience whilst mixing a large bowl of chopped vegetables that he’s holding with his left hand. Close-up of Jamie mixing the bowl of chopped vegetables. Cut back to Jamie addressing audience, spooning the vegetables on to the tortilla. that have been sliced, we've got chillies, sage, garlic. And then we've got a nice handful of spinach going on top like that. Like that. Jamie starts to roll the wrap. And then comes the technical bit. We want to wrap it. Cut to Jamie wrapping the sides of the wrap. Close-up of Jamie rolling up the wrap. and roll it up like that and there you go. Cut back to Jamie cutting the wrap at an angle. and look at that! A beautiful roasted veg Mediterranean wrap with ricotta cheese. Cut back to Jamie addressing the audience and pointing at the wrap. In there is at least one of your five fruit and veg a day. Cut back to Jamie addressing the audience with animated hand gestures. you get hungry, pop in and see us, and have a little try. Upbeat piano music. Close-up of Jamie moving the two halves of the wrap to show the filling. Egg, tomato, capers & mayo sarnie - You can’t beat a posh egg sarnie, made with beautiful free-range eggs and tasty oatmeal bread. We've added watercress and tomato to boost your daily fruit and veg, and the little capers are a joy! A short video of Jamie Oliver talking us through the Jamie Oliver deli by Shell Egg Mayo Sandwich. Jamie in his kitchen, standing at the workstation with chopping board and knife at the ready. Fresh ingredients are dotted around the kitchen. As he talks, he gesticulates passionately. Millions of us eat on the go every single day, and it can be a real challenge to get something delicious and that’s trusted for you and your friends and your family. Punch in on Jamie. Jamie Oliver deli by Shell logo top left, GO WELL Shell logo bottom right. Jamie spoons from a bowl onto a wrap, which has been prepped with a tasty-looking sauce. Close-up of two wrap halves, appetising and fresh. Jamie layering ham hock on an open sandwich, prepped with bright yellow mustard. on some great old classics. Close-up of Jamie picking up a handful of fresh watercress. Jamie at the workstation, ready to prepare egg sandwich. So, I’m going to show you the egg sandwich – standard, right? Not anymore. So we’ll start with the bread. Close-up of Jamie slicing bread. Jamie at the workstation, preparing sandwich. Close-up of mayonnaise in a bowl. Knife spreading mayonnaise on bread. Punch-out to Jamie spreading. Close-up of capers in a bowl. I’m going to get some fantastic capers, whole, just sprinkled in like that. Close-up of Jamie sprinkling capers on bread. Punch-out to Jamie sprinkling capers. Close-up of Jamie sprinkling capers on bread. Punch-out to Jamie, talking passionately about sandwich. Punch-in on Jamie. Now with the egg sandwich, many of them are mushed-up, forked-up, put through a mayonnaise, they can be a bit soggy. I don’t want that for you. I want you to see what you’re going to get. Close-up of Jamie taking a freshly-peeled egg from a bowl. Punch-out to Jamie talking about eggs. Close-up of Jamie putting egg in slicer. and they’ve been cooked to perfection. So we’re going to get an old slicer like this – me Nan used to have one of these. Punch-out to Jamie preparing sandwich. Close-up of Jamie laying slices of egg in sandwich. So by slicing it, we get a completely different look. Punch-out to Jamie preparing sandwich. Close-up of Jamie laying slices of egg in sandwich. and the texture is much, much nicer. Punch-out to Jamie talking about preparing sandwich. And then next, some sweet delicious tomatoes. Close-up of Jamie slicing tomatoes. Punch-out to Jamie talking preparing sandwich. but the flavour combo is everything. Close-ups of Jamie laying slices of tomato in sandwich. Jamie taking a handful of fresh watercress and placing in sandwich. Close-up. and then a nice, little wodge of peppery watercress. And that’s it. Jamie places bread on top of sandwich. Pushes down firmly once. Close-up of cutting sandwich in half. Punch-out to Jamie arranging sandwich halves. Little bit of the bread on top, cut in half… come on! Close-up of tasty-looking sandwich filling. Jamie arranges sandwich halves on the chopping board. Close-ups of Jamie arranging and stacking sandwich halves. made with love and care is a thing of joy. Punch-out to Jamie promoting Jamie Oliver deli by Shell range. So next time you get hungry on the go, why not check out the Jamie Oliver deli by Shell, and see the whole range? I think you’re going to like it. Jamie takes a healthy bite of sandwich. Makes a ‘mmm, that’s good’ expression. Close-up of tasty-looking sandwich half. JAMIE OLIVER deli by Shell logo middle top. Jamie in his kitchen, standing at the workstation with chopping board and knife at the ready. Fresh ingredients are dotted around the kitchen. Close-up of chopped, fresh ingredients – red pepper, yellow pepper, courgette and red onion – in a bowl. Jamie spoons from the bowl onto a wrap, which has been prepped with a tasty-looking sauce. 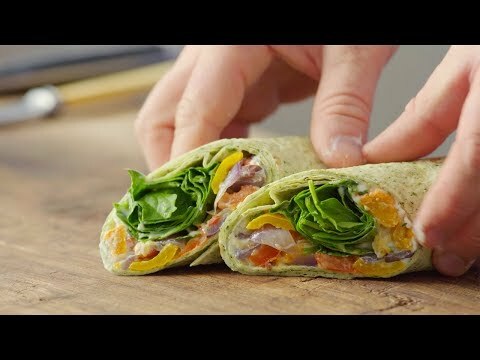 Cut to close-up of Jamie adding fresh spinach leaves to the wrap. Jamie Oliver deli by Shell. Cut to Jamie addressing audience, impassioned and using hand gestures. It’s really simple, we want to help you guys have more choice, more quality, more flavour. We want it to be clean and clear, and help you guys. There’s so many of you, millions of you, every single week going around the country who are trying to grab food on the go, and we want to do it better. Close-up of Jamie holding a sandwich. Close-up of two wrap halves, appetising and fresh. Slow zoom in. grafters, and school kids – whoever’s using the forecourts a trusted place to get better food. Punch in on Jamie addressing audience. Now food on the go has always been kind of related with fast food, junk food. Close-up of open sandwich being prepared. Sliced tomatoes on slices of egg. You know, it’s been in need of a little pushing up. Two sandwich halves stacked one on top of the other. Tomatoes in foreground, as well as slices on chopping board. Jamie is lifting the full, appetising sandwich halves with both hands. Cut back to Jamie addressing audience. Often, you know, these things are about indulgence. Close-up of mini sausage rolls raising in oven. Great, we’ll still have indulgent items. But I wanted to give you some really nice fresh options. You know, really push things like the sandwiches, the wraps, the salads, the sushi, hotpots, and get more veg in there. Jamie spooning fresh ingredients from a bowl. More fruit and more veg, more colour. Close-up of Jamie slicing tomato. Close-up of Jamie dicing spring onion. Close-up of two halves of a wrap. Jamie positioning to show filling. Close-up of wraps, showing tasty filling. and it’s really clear, and very tasty. So there you go guys, let’s see where we go. You’re part of the story as well, it’s not just me. I have me and my team deeply embedded in this. And of course we’ll be listening, we’ll be listening to you. Not everything we’re going to do is going to work, but I’m going to do my very best with everything I’ve learnt over the last 20 years to serve you well. So that’s it! Take care, guys. Lots of love, and I hope you have a great day. Take a look through some of our tasty favourites, why not give them a try? You’ll find plenty of juicy tomato in this sandwich – so delicious with black pepper mayo. The perfect match with bacon and crispy lettuce, it’s the dream combo. Including a whole portion of your daily fruit and veg, this rainbow wrap is the perfect balance of sweet roast veg and creamy ricotta – it really hits the spot. An epic mix of sweet potato falafel, warming harissa dressing, giant couscous and earthy beetroot houmous – every mouthful is different. Get stuck in and enjoy!. 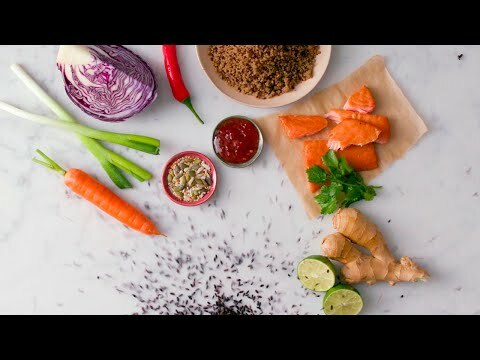 Great ingredients are at the heart of our food. Discover more about the nutrition information, welfare standards and allergy advice. We’re proud of the food in our new range, and the work we’ve done to really take it up a gear. It’s all about big flavours, fresh ideas and clever twists. There’s the classics, such as sandwiches and wraps, that have been given a Jamie update, alongside a brand new selection of delicious products including salads, sushi, hot pots and a range just for kids. There’s something for everyone, including revamped indulgent items alongside these new, delicious alternatives. You’ll find plenty of tasty choices for your journey, at breakfast and lunch. Jamie has been closely involved in creating the recipes and testing all the food that we’re serving in our brand new range. This is great food, made with love and care. We’ve taken the ingredients and flavour in every product to another level. We’ve added half a portion of veg to loads of sandwiches, and dialled up the bread using oatmeal and wholegrain. Plus, you’ll see detailed nutritional info on packaging, with easy-to-read traffic light labelling, so you know exactly what’s in each product. Around 60% of the range are green or amber on the traffic light system. There’s plenty of fruit and veg across the entire range. You can find Jamie Oliver deli by Shell and a tasty bite to eat at your nearest Shell service station. Call in for some exciting flavours! *All products are subject to availability. Bigger, better choice, nutritional details – when compared to previous deli2go range or other previous food offering. How many products are there in the new range? The new Jamie Oliver deli by Shell range offers a variety of choices for our customers. 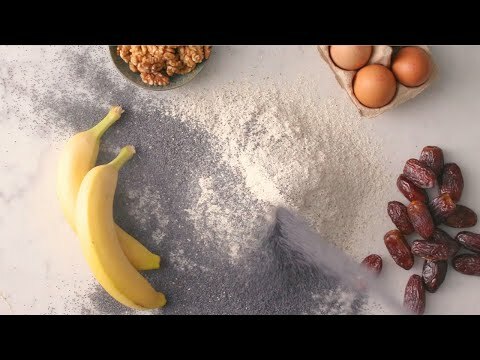 The new menu will include more than 80 products to ensure that whatever our customers are craving – be it a salad, sandwich, wrap or a delicious pastry– you can find an exciting option at Shell. More information on products is available at www.shell.co.uk/motorist/food/jamie-oliver/good-to-know.html. Are you offering this at all Shell service stations? What is Jamie Oliver deli by Shell? Jamie Oliver deli by Shell is our brand new food range which we created with Jamie Oliver. This offers our customers big flavours, tasty and nicely balanced food, using honestly sourced ingredients, that simply go well together. We’ve gone the extra mile to create a bigger, better choice*, to help our customers to eat well on the go.